Hello! Oh my goodness! Am I excited! My lady Board members are excited! My fellow Merms, as we’re affectionately called are excited! 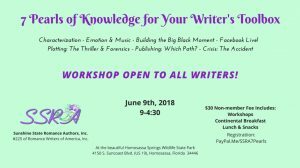 Sunshine State Romance Authors, chapter #225 of Romance Writers of America, located in sunny (most of the time), Homosassa, Florida, is presenting two workshops to teach the craft of writing to pre-published authors, as well as helping published authors enrich their manuscripts. Both events are affordable! 6/9 $30. 6/22 $45. BOTH $65. Save $10. Write in the amount you’re paying. We’ll know what event(s) you’re registering for! More directions by the 9/22/18 event below. Sunshine State Romance Authors was founded in 2012 with three published authors. Now, we have over seventeen traditionally and Indie published authors combined. Even though becoming published is not promised through membership, and I’ve said this before, and I’ll say it again; I would not be multi-published today if it weren’t for what I learned from these amazing men and women. I wanted to give back for what I learned, so I excitedly volunteered to be President for 2018-2020, and was voted in. 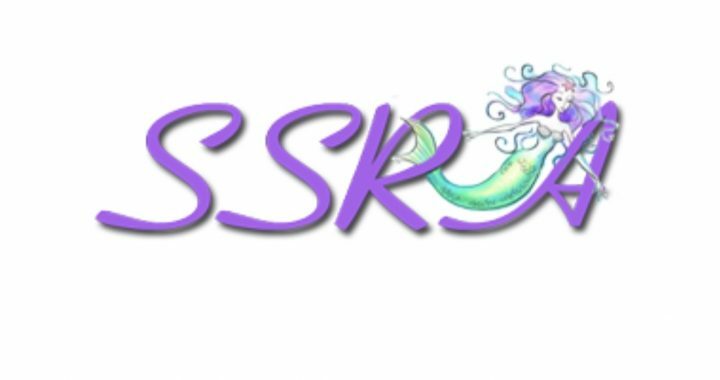 SSRA is an organization dedicated to the education of writers who want to become published. Follow us on Facebook at Sunshine State Romance Authors. Also http://www.sunshinestateromanceauthors.com. Please note, our website is in the midst of renovation. Thank you for understanding. Both events are affordable! 6/9 $30. 6/22 $45. BOTH $65. Save $10. Write in the amount you’re paying. We’ll know what event(s) you’re registering for! More directions below! The second workshop is an all day event, Saturday September 22, 2018. Angela James of Carina Press is coming to present a workshop on What Publishers Want and do a cold read critique of the first two pages written by pre-published romance authors. We can only do what time allows and it’s first come, first serve. This event will be held in the gorgeous Citrus Hills Golf and Country Club, The Hampton Room (509 E. Hartford Street, Hernando, Fla. 34442) 9-3. After you register, you’ll be sent via the email on your PayPal, directions for submitting your first two pages to us (SSRA Board), and your lunch choices. Attire for this event is Business casual. The cut off for registering is Sept. 14th. Included in the affordable price of $45. is the workshop, breakfast, a three course lunch (vegetarian and gluten-free options will be available). Every guest will receive a swag bag. For those of you traveling, we have reserved a block of rooms at the nearby Quality Inn, (350 E. Norvell Bryant Highway, Hernando, Florida 34442.) Call them at 352-527-0015 and tell them you’re registering for the Sunshine State Romance Authors event and you’ll get our room rate for Sept. 21, 22. Again, the cut off is Sept. 14th. Both events are affordable! 6/9 $30. 6/22 $45. BOTH $65. Save $10. Write in the amount you’re paying. We’ll know what event(s) you’re registering for! If you prefer to speak with me because you know me through my blogs, please feel free to email me at ronnieanovelist@aol.com. 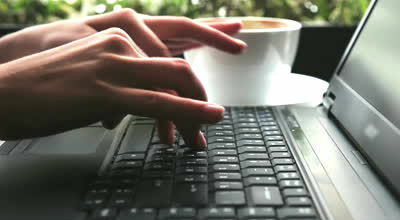 If you’d like to message me, please do so through my Facebook author page http://Facebook.com/ronnieanovelist. I’ll be happy to assist you.